Published on 19 January 2010. The inefficient status quo - surely there's a better way? There’s been a lot of heat about the NHS National Programme for IT recently, with both Labour and the Conservatives suggesting that it will be, at best, scaled back. Often referred to as “the £12bn NHS Computer”, the idea of having a national IT system for the NHS is often ridiculed as one of Whitehall’s biggest white elephants. But, contrary to what almost everyone else thinks, I firmly believe that a national NHS computer system is a good idea. I think it has the potential to revolutionise healthcare, and vastly improve the health of the British population in a much more meaningful way than anything else the NHS has ever done. As a doctor, I’ve worked with a variety of NHS IT systems, some of which are brilliant, and some of which are terrible. On the one hand, I’ve worked with an electronic patient record system in a hospital Trust that is an absolute disaster of a system. It does not fit in to the way anybody works, it is obstructive, and it actually provides less data in a less useful manner than the paper system it replaced. It is terrible, and should never have been introduced. Projects like this give NHS IT a bad name. On the other hand, I’ve worked with SystmOne in Primary Care, which is a Department of Health endorsed Über success of a computer system. The data is stored in a secure cloud, the program auto-updates, and it is constantly being improved. It’s a massively powerful system. When recent research showed that a high proportion of patients with diabetes and a history of heart attacks would have undiagnosed heart failure, it was the work of moments for a practice near me to generate a list of such patients and invite them for screening. The upshot was that the detection rate for heart failure soared by a factor of ten, and those patients are on the right treatment for their condition. Without the IT system, this could not have been efficiently acheieved. It would have involved looking through thousands of sets of paper notes, which is just not practically possible. The implications for the availability of this sort of intervention are manifest. And that’s on top of the often sold benefits of all doctors, wherever you go, having access to the same set of complete medical records. The disease-coding in SystmOne is done in an intelligent and unobtrusive way. If I type someone’s blood pressure in as part of a consultation, this is coded instantly and automatically by the computer, which merely highlights the data to show that it has been entered into an encoded database. Similarly for when I enter a diagnosis – coding is quick, automatic, and accurate. If, for example, I note that someone has diabetes, this is automatically captured and the patient is automatically sent letters for diabetic annual reviews. That is astoundingly clever, and stops individuals falling through nets. Incidentally, the crap IT system does none of this. It is badly designed by people not familiar with the day-to-day workings of individuals in the hospital, and is actually obstructive when it comes to getting things done. 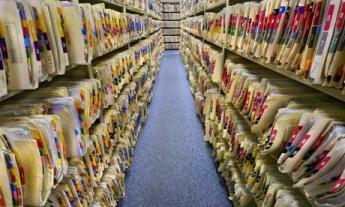 In most hospitals which remain paper-based, data intelligence just does not exist. The data on millions of pages of paper notes cannot be effectively mined. In order to receive payment for the services an NHS hospital provides, all the paper notes are shipped to a department named ‘coding’, where they are combed through by a team of non-medically trained secretaries, who decide from the often illegible medical notes how many patients with a given condition have been treated, and what interventions have taken place. It is slow, innaccurate, labour intensive, and doesn’t result in a patient identifiable database for mining. It is an extraordinary waste of time and money. If a system like SystmOne could be extended to cover all NHS care, all over the country, the database it would produce would be immense, and the opportunities for mining of that data would be far more advanced than anything else undertaken by any country on earth. We would know at a glance if an outbreak of a disease was happening in a paticular area of the country. Research could be acted upon in a flash with intelligent, national, targeted screening programmes. And that is just the start. A well implemented national NHS IT computer system would revolutionise care in the NHS – and frankly, for that, £12bn is an absolute steal. This post is based on my contribution to Episode 17 of The Pod Delusion, originally broadcast on 15th January 2010. Other topics that week included “The Big Freeze”, Google, and ITV’s regional decline. How could you not want to listen to the whole thing at poddelusion.co.uk? This 1,407th post was filed under: Health, News and Comment, Politics, Medicine, NHS IT, Public Health, SystmOne. Comment posted at 13:26 on 25th May 2010. I think there is great value in physical books, even beyond whatever words they may contain. I remember being a kid and opening my parents’ huge unabridged dictionary for the first time, just to look. Even though it might be easier to look definitions up on the internet, the smell of that old book and its weight on the stand are worth having around. Comment posted at 12:13 on 25th August 2011. I’ve worked in IT in the public sector (3 years with HM Customs). I think most people would agree this super-system is something that *should* happen, but no right-thinking person would condone the cost. Comment posted at 22:23 on 12th December 2013.
this is exactly what happens when SystemOne is implemented outside of its intended arena. It can’t. It’s a GP system, it does what it’s designed for very well. Trying to use it for anything other than it’s designed for , such as community services, creates an absolute nightmare & has negative effect on patient care. You’ll find it’s far more stifling, should you try get data from the “cloud”.